People are asking me about life insurance requirement etc. 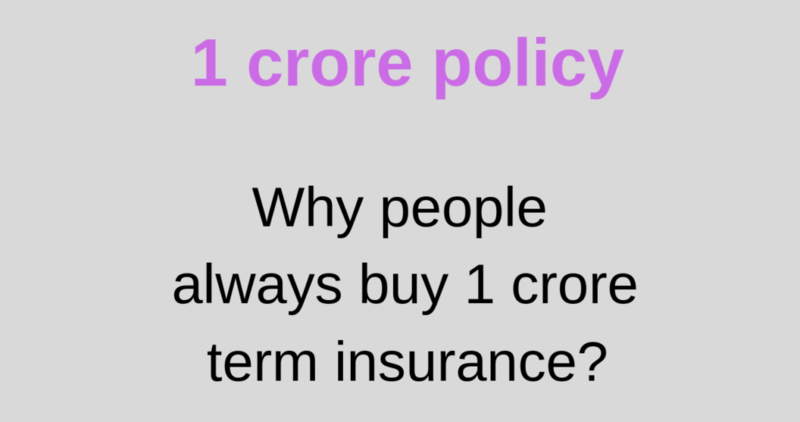 One of the regular they ask is term insurance for 1 crore policy is a good idea or not. Why people always ask about 1 crore life term insurance. There seems to be some mental blocking. Here, in this article I will explain the reason behind this. Why people always buy 1 crore term insurance? People really do not know the life insurance coverage that they need to take. I will explain in a simple way. For example, If a person is earning Rs.4,00,000 per year and his age is 30 years. His salary hike expected every year is 10%. Then after reducing his self expenses and expected future taxes his present value of net worth in today’s cost will be calculated. From the above value arrived present existing life insurance cover will be reduced to arrive to the life insurance requirement. You can use this online life insurance calculator to know the insurance coverage required. Click here to calculate. When it comes to Need-based analysis, we planners will calculate present value of the loans outstanding, corpus required for special needs like child education, dependent expenses and house buying etc in today’s cost by deducting the discretionary assets value( excluding own house). There are so many methods to calculate the life insurance requirement. But Most planners will follow need-based analysis. As most people do not know these methods, they tend to buy random life insurance 1 crore from life insurance companies. 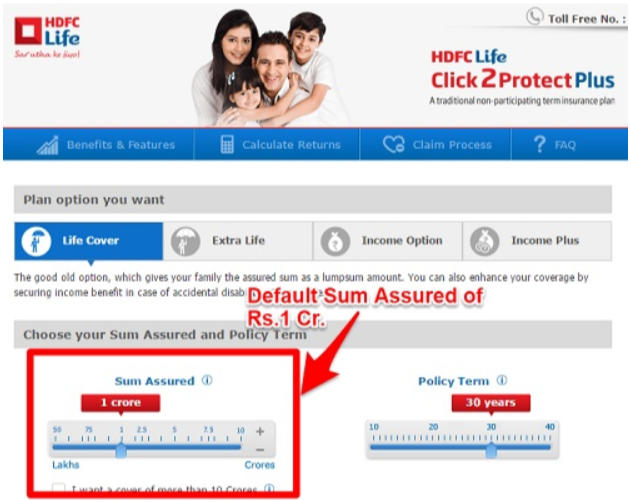 I have checked some life insurance companies website, they are offering default term insurance for 1 crore. term insurance for 1 crore policy why people take? As insurance companies are showing default option of 1 crore, majority of times people tend to buy 1 crore term insurance policy. If we are buying Idly etc out side, sellers always round off the price. They will not sell idly for 1.25 rupees. Similarly when we require 80 lakh term insurance, we will try to round it off to 1 crore. This is also one of the reason, we will go for 1 crore term insurance. Few decades ago lakh pati trend is there. People want to become lakh pati those days. As rupee value has fallen all these decades, now people are dreaming of becoming crorepati. Due to inner feeling of crorepati, people are buying 1 crore term insurance. Buying term insurance based on the emotions discussed above is not a good thing to do. Analyze the need of life insurance cover under need-based analysis, and then take the required term insurance on your life. Read article about lic vs pli- which is best?. Click here to read. Also, read article about new Jeevan Anand-Why it is not good to you?. Click here to read.